I just thought it would be best to warn you up front, these are spectacular. Crunchy, salty, cheesy, savoury, addictive. I’m one of those people who is usually quite satisfied with a small handful of chips or a single spoonful of ice cream or one slice of cake but with these crackers all bets are off. I’m not even kidding. 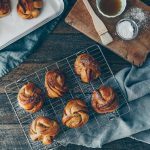 It’s the last Monday of the month and therefore time once again for a Secret Recipe Club post. 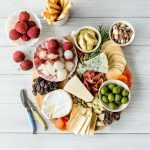 This month I was assigned the lovely blog Fearless Homemaker, and talk about making it difficult to decide, Amy has so many wonderful sounding treats to choose from! A number of different apple muffin recipes called out to me as did her buttermilk biscuits and pumpkin spice cookies but it was the Homemade Cheez-Its that had me at hello. Shocker, I know, but the result is still the same – little crunchy bites of cheezy-with-a-Z goodness that take every last ounce of control not to eat them all at once. Combine all ingredients except extra salt in a food processor and pulse a few times to combine. Run the processor for about a minute and a half until the mixture resembles couscous. Turn out onto plastic wrap, press together and shape into two flat-ish disks, wrap in the plastic and chill for 30 minutes. Preheat oven to 180C [350F] and line a baking tray with baking [parchment] paper. Place chilled dough between two pieces of baking paper and roll very thin – to approx a milliliter or two. Cut the dough – still on the paper – into 1 inch strips using a pizza cutter or sharp knife. Cut again on an angle to create diamonds. Use a toothpick to make a hole into the center of each square. Slide parchment paper with cut dough onto a tray and refrigerate for 10 minutes. Transfer the individual pieces of dough onto your previously prepared tray leaving a tiny bit of space between crackers. Sprinkle with a pinch of extra salt if you wish. Refrigerate on tray for 5 minutes. Bake in the pre-heated oven for 9-10 minutes, until crispy and just golden, turning tray halfway through baking. Briefly cool on tray then move to a wire rack to cool completely. Repeat as necessary to bake all crackers. Trays: if you have a couple trays you can use one to keep the dough cool, and one or two for baking the crackers in batches. Refrigerating: if the dough gets too soft while rolling and cutting slide the paper onto a tray and pop into the fridge for 5 mins before continuing. Baking the crackers straight from the fridge means they stay flat and don’t puff much. Cutting: yes, you could bake them as they are cut, right up next to each other. They will snap apart after they cool but they look better if separated beforehand. these look really good! it nice to know that the good stuff is going into them! Now I really want to make these. I could eat a whole boxful of them. Wow, these look like they came out of a box. But I bet they are way better than something you could buy in the store. Good choice for SRC! Happy Reveal Day! These look amazing. I believe every word you say about them being delicious. Mmm these look like they’d be good for my pre-dinner nibbles treat. Yum! 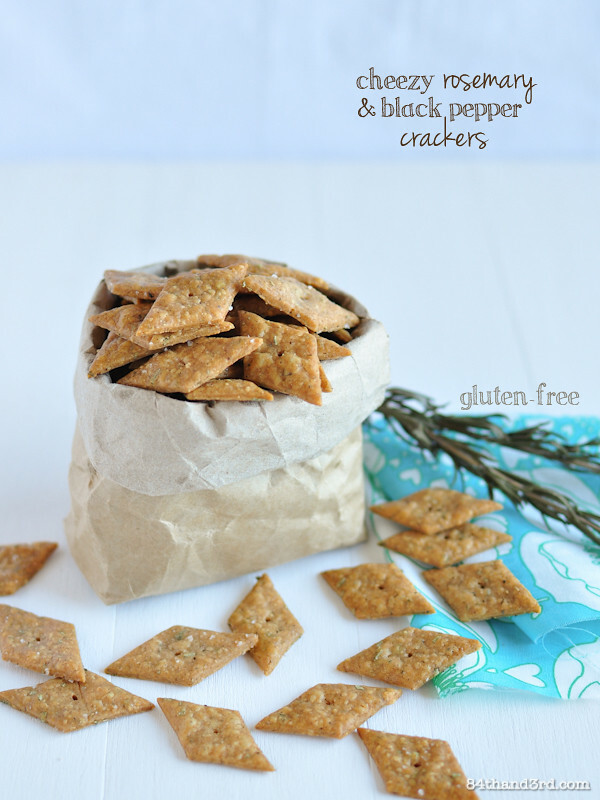 What tasty crackers, I love rosemary and black pepper! Wow–how did you get your crackers cut so perfectly?!! 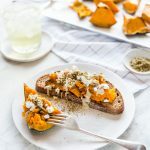 I’ve been collecting gluten free recipes for my brother-in-law, but this is the first GF cracker I want to try and soon. Great SRC pick! Well I just have to give these guys a go. 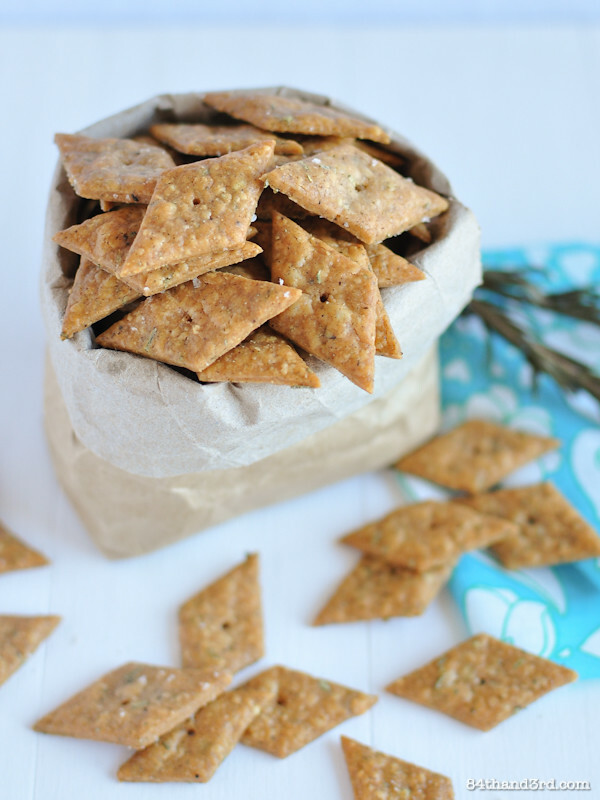 They are Crunchy, salty, cheesy, savoury and addictive after all! I bet these would be such a perfect snack! I know I’m a bit late for the whole SRC blog hopping, but better late than never! These crackers look so amazing and perfect! You have some mad cracker cutting skills! I like the fact they take buckwheat flour, as I do have a bag in the freezer that is still 50% full. These do look addictive! Love the pics…great SRC pick! 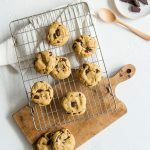 Could I use all purpose gluten free flour? Also for the cheese would cheddar work? Thanks! I would imagine that ap gf flour would be fine and yes, any semi-hard cheese would work! 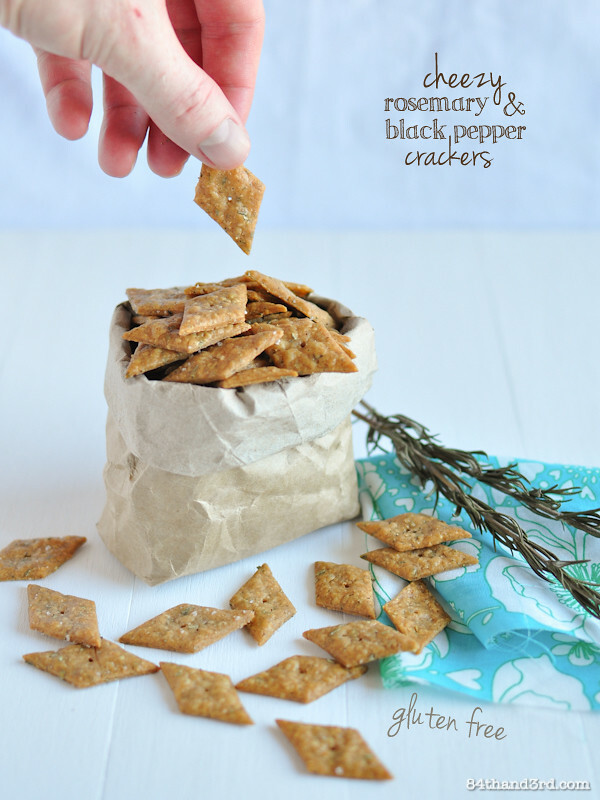 need to make these, i love making homemade crackers but dont seem to do it often enough!